Festival del Pueblo will be a 5 day event to commemorate May Day. From May 1st to May 5th different events and activities will be taking place. From Revolutionary Soccer Tournament, to an Anarchist Bookfair, from Direct Actions to Free Schools, from Concerts to a Carnival Against Capitalism. 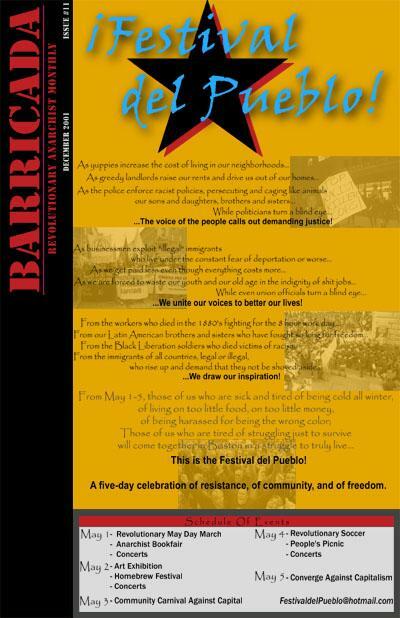 Come join the festival, a five-day celebration of resistance, of community, and of freedom. Get this cool 11x17 poster by subscribing to Barricada! If in the US or Canada, 15$ will get you 6 months of magazines. If in Western Europe, 20$ will get you 6 months of North America's only revolutionary anarchist monthly. We also accept supporter's subscriptions, donations and exchanges (at discretion). For a free sample contact us by e-mail or regular mail.